Alice wants to learn the monkey bars. 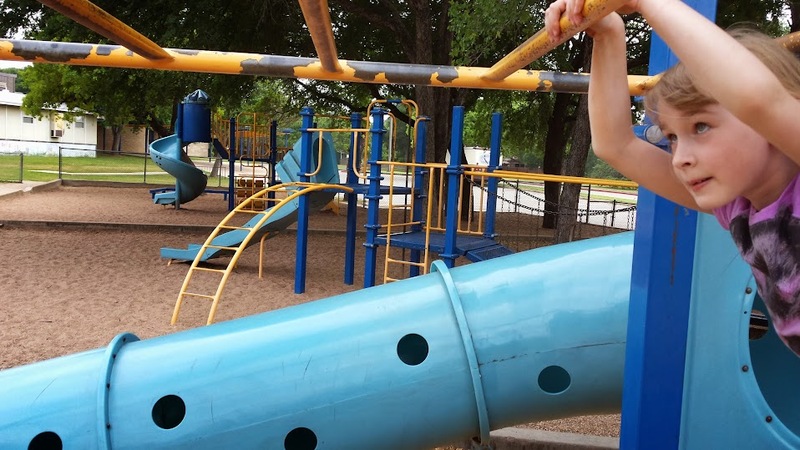 She is firm in her desire to learn this playground skill, to not be afraid, and to make it all the way to the end. She clearly says that she wishes to learn this and exhibit it before her classmates. I'm impressed by her exhibition of will. She asked me to take her to school after hours so she could practice. She pushed her Mom too, when I didn't want to go back the next day. Three days on and we are at two a day practices. She responds well to coaching. She seems to understand that it serves her goal and so has no problem with obedience during training. I say this not because she has any "obedience" issues otherwise, she listens quite well for a six year old. I say this to contrast it from her naturally skeptical or questioning nature. Usual interaction has much back and forth. The training mode she has found provides her with a different mode of behavior, one where she can receive more direct instruction and provide more direct response, without any sensitivity to feelings that might otherwise preclude such directness. Look at that face, the set of her eyes, the way she is holding her lips, and the preparatory tension in her arms. She will be a formidable adult.